Waterfront cottage nestled in a quiet bay. Relax and enjoy the shifting moods of the sea from the comfort of your living room. Swim, fish or snorkel from the rock pools at your doorstep. It is a short coastal walk along a lovely informal path to Stockton beach and the famous Stockton sand dunes. From June to August you can watch the passing parade of whales as they migrate north from the comfort of the living room. Having trouble finding quality accommodation for the Hunter Valley concerts? Why not stay by the ocean and catch the Port Stephens coaches to your concert. The cottage has 3 bedrooms and 2 bathrooms and comfortably accommodates 6 people. There are 3 queen size beds. There is a large lounge and dining room. The majority of rooms have ocean views. Enjoy Camel treks in the sand dunes. Horse riding along Stockton beach. An International standard golf course is a 5 min drive. 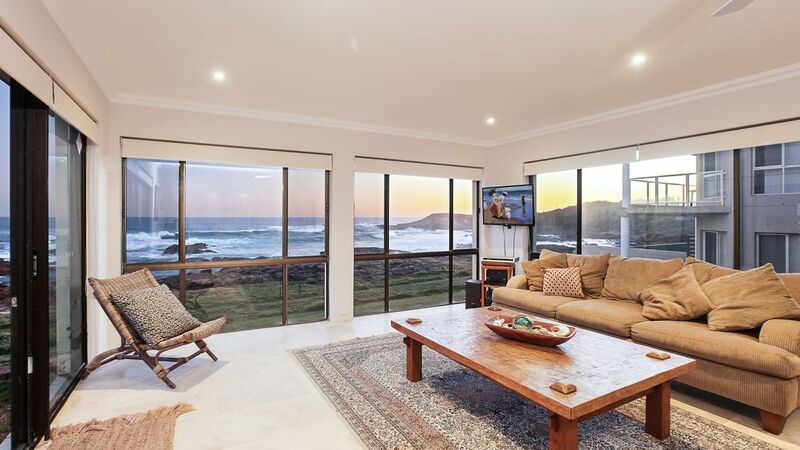 In winter the lounge room provides a cosy vantage point for whale watching. For the kids there are safe and patrolled swimming beaches. The beach cafe overlooking miles of uninterrupted surfing beach and sand dunes is a short walk away. Other attractions include: Driving range; Go cart track; pool and water slides. We stayed here for 9 nights 24 Dec to 2 Jan and had a total dream of a holiday! We have a 3 year old and invited my parents along, there was so much to do for everyone. The views are amazing, and the rock pools just steps from the back door are possibly the best rock pools I have ever seen. No need for the beach with rock pools like that! The house has been beautifully done up and styled perfectly. We were so sad to leave. Definitely want to come back one day soon. Thank you Christina, I"m very happy to hear you enjoyed your stay, we hope to host you again one day. We had a wonderful time at this remote part of Anna Bay. The cottage is in a great location an offers fantastic views from dawn to night. You hear nothing but the sound of the ocean. The property is well equipped and offered everything we needed. We felt very comfortable and where sad to leave. Would come back again anytime. Thank you, our little bay is very special, I'm so glad you enjoyed your stay, we hope to see you again some time. A lovely property - the master bed was extremely comfortable and the house was well appointed and had everything we needed for a relaxing and lovely stay. Saw dolphins from the lounge room, spent many an hour curled up on the comfy lounge drinking cups of tea and watching the waves. The kids loved exploring the rocks and we didn’t even have to go out as we could see them from the house. Close proximity to Birubi beach - a short and scenic walk away. Great location. Recommend. We really loved the view, the bathroom is great with rainfalol shower. And the beds are extremely comfortable. Lidia the owner is awesome who answered every little questions we had. Not to mention there is TelstraTV with all the latest shows! Everything is superb! Can’t wait to go back next year! Very cozy and comfortable home. Having the uninterrupted water views meant we were able to stay in and enjoy natures ambience while it was raining. Perfect for relaxing and unwinding. Lovely place, amazing location and there was always a whale on the horizon!